My First Time is a regular feature in which writers talk about virgin experiences in their writing and publishing careers, ranging from their first rejection to the moment of holding their first published book in their hands. 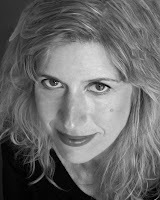 Today's guest is Edie Meidav, author of the novels Crawl Space, The Far Field and Lola, California. A former director of the MFA program at New College on Valencia Street in San Francisco, Meidav is now in residence at Bard College. Her poetry, fiction, and nonfiction have been published in Ms., The Village Voice, The Kenyon Review, Terra Nova, The American Voice, New Letters, Conjunctions and elsewhere. She has received a Lannan Fellowship, a Howard Fellowship, a Bard Fiction Prize for Writers Under 40, a Kafka Award for Best Novel by an American Woman, a Fulbright in Sri Lanka, and her books have been called editorial picks by the New York Times, the L.A. Times, the Electric Review, the Litblog Coop and elsewhere. Visit her website here. Here’s a belief of mine: if you put yourself in the path, you eventually stumble upon people determined to be helpful. This happened to me with a friend of mine whom I will call “B.” I met B during graduate school, one I had chosen for the singular reason that an author who had informed my sense of narrative when I was a child taught there and I sensed I could learn from this author. I also was not ready to ask someone with whom I was involved with to move many states away, and was seeking an excuse to be back in my home state of California. Perhaps, however, the greatest gift that came from those three much-maligned letters, the MFA, was this friend B. While I was working toward my MFA, I wrote a novel about a tiny woman ruler on an invented island in a time of colonial warfare, one that I submitted when I applied for a Fulbright to Sri Lanka. However, once I got to Sri Lanka, I threw away all that prior writing and instead started investigating and writing what would become my first novel, The Far Field: A Novel of Ceylon. Two years later, a native Manhattanite friend wrote me and said: What are you still doing there? Come live here. This operated as enough of a call that I answered it. Otherwise, I could have stayed in the tea-drinking atemporality of my Sri Lankan life. Once I was settled in Manhattan, I started to see B again. She had moved there and was quite at home in her own form of village life: walking her dog, involved with various women's-media associations, living the life of a twenty-something in New York. She had, may it be added, a well-honed matchmaking personality, making her a unique catalyst. One day she insisted I meet a young intern named Eric who was, at the time, handling FedEx packages and the like for a literary agent. “The agent will like all those kinds of residencies and fellowships you’ve gotten,” she insisted. “Bring a disk with your novel on it then,” she said. Why was I so reluctant? Something about being a twenty-something in New York meant I let the answering machine fill up with the exciting urgencies of all the people I had recently met. How was I supposed to work all the jobs I was doing at the time--temping, copy-editing, teaching--and also finish my novel and read and answer the calls of all these alive, dynamic, hungry people? One of the conundra of the apprentice writer is this: you must live life to know life, but you must have time to reflect on life as well. Time is your only commodity. So I had the pleasure of going to a small West Village café and meeting the intelligence of this guy named Eric: he was wry and aware, knowledgeable, had studied in Berkeley and worked for Oxford University Press, was filled with distance and passion in the exact quantities I could understand. He was interning for an agent named Bill. Whatever the alchemy of his psyche, he made me want to hand over the disk for him to give to Bill. At some point, a few weeks later, I was summoned to Bill’s fancy literary agency to bring over what was a veritable crates-worth of my past writing. I watched all the black-cloaked storks in the agency come over and, almost literally, coo over the quantity within that crate. Eric sat there, wry at the front desk, smiling as if to say: see, it’s all a game but it will all work out. I fled backwards, feeling like I had to sit on a curb, as if I had been kissed on the cheek by some great force--much like the time in college when a mentor had called me in to tell me he was recommending me to his editor for a prize. I had not entered college as a writer; I thought that one chose as a profession the kind of activity that did not come easily. I had been a biology major and had spent years painting and also, briefly, had a dance scholarship in New York City. Only at the eleventh hour had I decided that with a strong “no” might come a strong “yes.” I had laid aside my paint brushes and, for my last semester, enrolled in a class with this writing mentor, Peter Matthiessen. The great force continues. Now, so many years and three novels later, Bill has been my agent and Eric my editor. Both of them have served as inspirational lodestars, true old-style editorial intelligences, both metaphysical and literary counsels, who have helped me when I might otherwise have stumbled in every possible sense. What might be useful in this story for the writer who is getting his or her start? 1. All your diversions are useful; the beauty of writing is that it redeems all suffering and turnarounds. 2. Obvious as it may seem, it is useful to put yourself in the path. In this case, the most direct path to the behemoth of New York publishing for me came from something of an obscure MFA program out in Oakland, California. 3. It is good to know people who consider themselves part of your team, who are operating not out of an ethic of scarcity but of abundance. 4. If you stand at any gate long enough, and do so in good faith, eventually an opening occurs. Call it luck. The older I get, the more I feel our destiny has to do with the principles underlying subtractive sculpture: we just have to get out of our own way to learn the lessons waiting for us to learn them. In my case, if you consider any moment of this story, one of the biggest obstacles came when I balked at that initial visit with Eric. But sometimes grace occurs, and in that moment, it came in the form of B barking at me: just bring the disk! So this is what I suggest to you: bring the disk. Bring, in other words, whatever you have. Bring it to the table. Have faith that if you keep doing this, and keep refining your work, there will be an opening in the world, enough to let you keep doing whatever your aptitude and calling insists you should be doing. Then--despite your own best and most sophisticated efforts at self-sabotage--be heedful enough to let the grace happen. Happen it will. Stay in the game. Be patient, accepting, hard-working. And even when the grace happens, don’t forget: bring the disk.